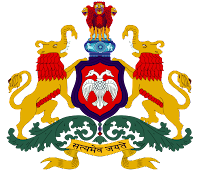 Date of Formation: 15 Aug 1947 Mysore state (1950-56, part (b), 1 Nov 1873 Renamed Karnataka. Neighbouring States: Kerala, Goa, Maharashtra, AP, Tamil Nadu. Sea: Arabian Sea. Main Political Parties: BJP, INC,JD (S), JD (U), CPI-M, Kannada Nadu Paksha, Kanada Chaluvali Vatal Paksha. 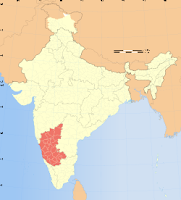 Main Towns: Bengaluru, Bidar, Gulbarga, Bijapur, Belgaum, Dharwad, Hubli, Raichur, Bellary, Shimoga, Tumkur, Hassan, Davanagere. Udupi. (b) Mountains: Western Ghats Chitradurga Hills, Mysore Plateau, Biligiri Rangan Hills, Namdi Hills, Gokak Hills, Badami Hills. (c) National Park: Bandipur Wildlife Sanctuary. (c) Agricultural Products: Jowar, sunflower, bajra, ragi, rice, maize, groundnut, mulberry, coconut, potato, watermelon, grapes etc,. 46% people are engaged in agriculture and allied activities. Horticulture: 15.81 lakh hectares. lnstalled capacity of power: 5836MW, Rural electrification: 100% Software exports: 35% of India’s exports. (d) Airporst: Bengaluru-Devanahali, Belgaum, Mangalore, Hubli. (e) Port: New Mangalore port is the main all-weather seaport. Adventure Sports: Ramangaram- rockclimbing-50 km from Bengaluru, Honnemardu on Sharavathy-coracle rafting,canoeing and wind surfing, Cauvery Fishing Camp-82km from Mysore for anglers, Kudremukh and Kemmangudi-trekking. Culture: Festivals: Mysore Dussera, Karaga, Ugadi (Kannada New Year), Diwali, kar Hunive, Navaratri, Yellu Amavasya, Ramzan.